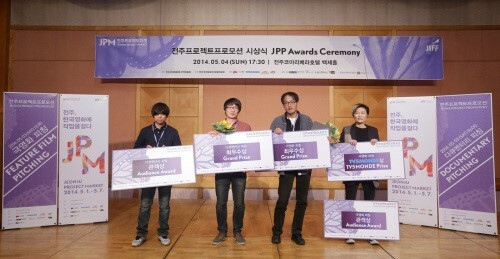 The Jeonju Project Promotion (JPP), which took place during the ongoing 15th Jeonju International Film Festival (JIFF), finished its 2014 edition on Sunday, May 4th with its Awards Ceremony. The Grand Prize winners were PARK Jong-keun’s Baby Rose in the feature category and LEE Dong-han’s A Big Day in the documentary section. Each prize was worth KRW 10 million (USD 9,734). Jude JUNG’s Perfect Neighbors, from the feature competition, also picked up the Audience Award (worth KRW 10 million) and the TV5MONDE Award (KRW 5 million/USD 4,868). Meanwhile, the Audience Award for documentaries went to Jero YUN’s Leaving Homeland. Previous JPP participants that have found success include Kelvin Kyung Kun PARK’s A Dream of Iron, which premiered at the Berlin International Film Festival this year and is competing in Jeonju, and The Omnivorous Family and Glory for Everyone, both of which are screening in the Korean Cinemascape section at Jeonju this year. Speaking of Glory for Everyone, the indie sports film about a youth soccer team at a child welfare institution was awarded the Korean Cinemascape Audience Award. The spectator prize, sponsored by Hana Tour, was awarded at the JIFF Lounge on Monday, May 5th.